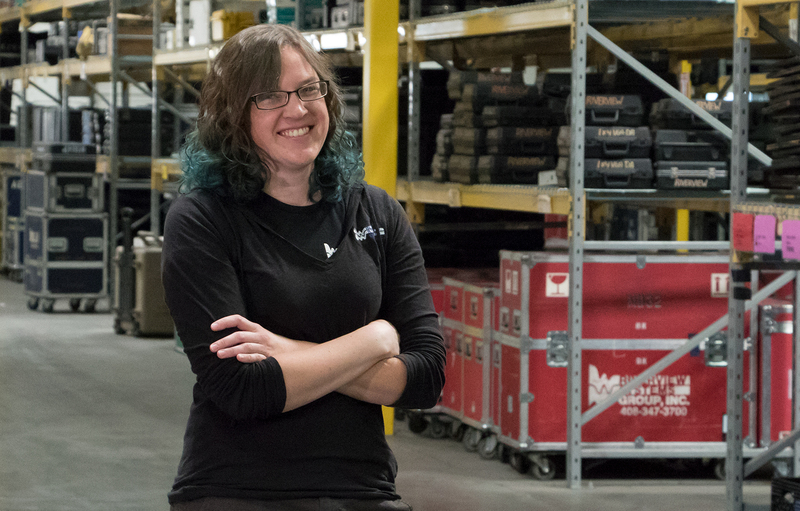 A Chat With Rebecca Van De Vanter, Lighting Specialist | Riverview Systems Group, Inc.
As a company that often prides itself for making its clients’ live event dreams come true, Rebecca Van De Vanter holds the unique position in making Riverview’s dreamers’ vision come true. In her own words, her role is largely to function as a go-between for our design services team and the physical end product that Team Riverview creates. “I take the team’s drawings and designs from paper and gather the gear and the power necessary to bring those ideas to life,” she says. Bringing ideas to life is something this UC Santa Cruz graduate has been doing for most of her adult life, although not on the production side, but rather backstage in traditional theatre. Before joining the Riverview family Rebecca worked around the Bay Area with a variety of companies as both a master electrician, similar to her current job, as well as on the creative side as a lighting designer. Q: Your background is in theatrical lighting. Tell us about that experience. Any interesting stories about particular shows or productions? Rebecca: My favorite experience is the four years I spent working with Shakespeare Santa Cruz getting to put on full- fledged theatrical productions in the middle of a forest. It was a joy to climb redwoods to hang lights and spend so much time outdoors. Occasionally we would have curious visitors from the forest come onto the stage or into our backstage area during shows, so I learned a lot about how to get a raccoon, deer or skunk safely away from everything. I also work with the Flying Karamazov Brothers when they tour, which allows me to run around the country and wrangle jugglers when I’m not running around the country and wrangling lights with Riverview. Q. What’s your day-to-day like here? Rebecca: Every day is a new adventure when we’re on site, so a “typical” day for me can involve many things. When we first start loading in a show I’m in charge of making sure that all the lights get hung where they’re supposed to and that the electrical system we’re putting together gets assembled correctly. Making our “rig” get up in the air and functioning is my primary job early on so that we can start programming, which is where the art comes in. At that point I’ll move away from the ladders and truss and more towards the lighting console. From there, the lighting designer and I will work together to bring the entire room to life with the angles, patterns and colors from our lights. Q. At what point in the planning process do you interface with the design services team? How do you work together? Rebecca: After the design team has put together their initial concept and intentions onto digital paper, I get the plans in order to start the process of determining what we need in terms of gear, electricity and support. This can sometimes become a more challenging process as we get updates and changes from the client or parameters within a particular venue. When we sit down together it’s really where the art meets the science. Q. What aspect of your job is the most fun? Rebecca: I love the variety. At any given time our design services team and our technical team are working on several different end products. Each of these projects comes with a new set of challenges to meet and play with, as well as a whole new realm of possibility out of which we get to truly transform a space. The end product of each show is never the same as the last one and we get to take inspiration from each environment we create to pass on to our next, and so forth. I also really enjoy getting to travel and meet new people. We get to work with a variety of individuals in each city we go to, and it’s lovely to be able to continue learning new things from these interactions. Q. What are the creative tools you can’t live without? Rebecca: From a practical standpoint, my computer is absolutely key. It has photos that I use for reference, as well as my music library and all the drawing tools I need. I always keep a sketchbook and/or notepad nearby in case I need to jot something down. However far technology comes, I think a lot of my best creative inspiration happens when I’m able to put pencil to paper. Q. Is there one Riverview project that stands out as the most challenging, but was ultimately the most rewarding? Rebecca: The projects I tend to love most, as a genre, are ones that have a lot of moving parts. Often our shows will have a lot of smaller presentations happening outside the general session, and it takes a lot of thought, work, people, and organization to keep them running. It’s challenging in how large scale it can be; while I’ve been working on how to be in several rooms at the same time I don’t have it quite mastered yet. Satisfaction for me comes from the successful transformation of a simple room into a continuation of the larger general session. Being able to have a small and unnoticeable hand in creating the environment for so many people to have an experience together is deeply rewarding. Q. What do you for fun outside of work? Rebecca: I tend to keep a pretty low-key lifestyle, overall. The fast-paced and ever changing environment that we work in leaves me ready for some quiet when I’m ‘off the clock.’ I’m a season ticket holder at the San Jose Giants and attend San Jose Sharks games when possible. The Bay Area has a wide range of local theaters that I enjoy attending, as well. Other than that, I love the time that I get to share chatting with friends and family. Q. What are you reading, watching or listening to? Rebecca: I tend to not watch a lot of TV or movies, but I recently finished the sci-fi novel “Cryptonomicon” by Neal Stephenson, and have big plans to start on something a little more nature-based soon in the form of some Edward Abbey. Musically my taste runs over the place. Yesterday it was Broadway musicals, but today it’s tending more towards Benga and dubstep. Maybe tomorrow will bring some hip-hop with it. Who knows?